Chances are that at some point during your tenure as a homeowner, you have experienced electrical problems of one kind or another, and at some point, you might have been tempted to just whip out the toolbox and take care of the issue yourself. While we commend your handyman spirit, we have to recommend that you always put the toolbox down and call in a professional instead. We have encountered numerous scenarios over our years of service in which a capable homeowner attempted to enact electrical repairs on their own, only to create new issues, or make the existing issue worse in the process, putting the safety of themselves, their families, and their homes at risk. Electrical repairs are one of those things that are just better left to the trained professionals, and to help highlight just why that is the case, our team of experts have taken the time to put together this short list that we hope will shed a little bit of light on the situation. While we are absolutely certain that no homeowner goes into a DIY electrical repair with the intention of putting their home or their family at risk, that is often the result. One of the most important reasons to leave electrical repairs to the licensed professionals is because these experts are trained in how to enact the repairs you need without compromising the safety of you or your family. In addition to fire hazards left behind by incomplete or improper work, working on your electrical system without the right equipment and absolute certainty of what you are doing puts you at an extremely high risk of being electrocuted, so for the sake of you, your family, and your home overall, make sure you leave any electrical work, no matter how small or simple it might be, to the trained experts. In order to become an electrician, you have to have years of training under your belt, and most continue to acquire specialist knowledge long after their initial training is complete. A DIY repair guide just isn't going to be able to match the level of expertise that a professional will bring to your job. 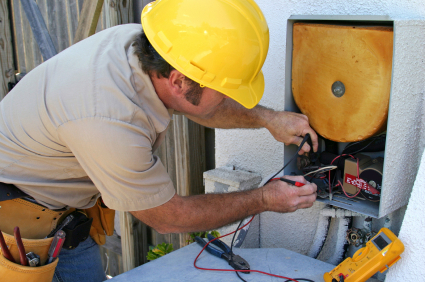 Licensed electricians have the proper training and equipment to quickly and accurately diagnose the cause of your electrical issues and take the necessary steps to fix them. They know what precautions to take while working, and they also know which issues might be a symptom of a larger problem that needs to be addressed. One of the most common issues we see when we have to come in and provide follow up repairs after someone has attempted a DIY fix is that in the course of their work, they have been so busy trying to treat a symptom that they actually miss the larger problem. Without the proper training and experience, it is very easy get caught up in treating the symptoms of an issue and miss the cause of it entirely. With the help of a professional, you can have any issues with your system identified quickly and accurately, as well as any underlying issues that might be responsible for causing the issue in the first place.